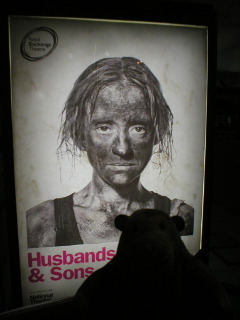 Mr Monkey caught a bus into Manchester for the press night of Husbands and Sons at the Royal Exchange Theatre. In the early 1910s D.H. Lawrence wrote three short plays: A Collier's Friday Night, The Widowing of Mrs Holdroyd, and The Daughter in Law. All three are vignettes of life in Lawrence's home town of Eastwood, on the Nottinghamshire side of the border between Nottinghamshire and Derbyshire. Lawrence died before any of the three were performed on stage. 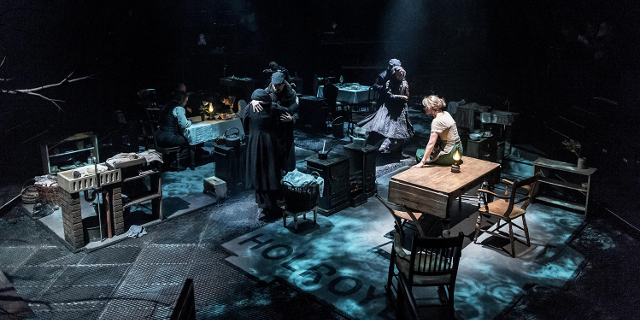 Husbands and Sons was created by combining all three plays into a single piece, presenting a composite slice of life in a mining community in the years before the Great War. As you'd expect from a single production made out of three short plays there are three stories in Husbands and Sons. 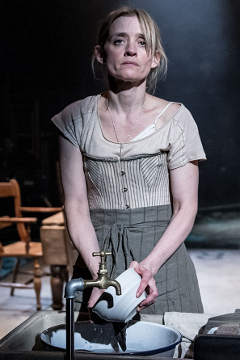 Lizzie Holdroyd has a brute of a husband, but also knows a besotted electrician with prospects in Spain. Does she really want to leave with the younger man? The Gascoigne brothers are dominated by their mother, and one of them has accidentally married an unsuitable woman as well as getting a neighbour's daughter pregnant. Meanwhile Mr Lambert thinks Mrs Lambert has brought their children up to despise him, and she is encouraging their son to better himself whilst insisting he stay at home. The whole place is seething with inter-generational, inter-gender and internecine resentment. Husbands and Sons has the most complicated set Mr Monkey has seen at the Royal Exchange for ages. Each of the three families has a house marked out, each with the basic requirements for life (a kitchen range, a washbasin and a large table) and the name of the family in large letters on the floor. There are no doors or walls, for obvious reasons. The houses are crowded together, parted only by narrow cinder paths, and the only sign of nature is a leafless tree. The whole set is surrounded at the start and the end by a grim metal frame which, while it reminded Mr Monkey of the frame of a gasholder, probably represents the industrial processes which define life in Eastwood. The soundscape for the production is excellent, though rather restricted to different quantities of rain and opening and closing of doors, but with some deafening and horrendous industrial noises at moments of crisis. The talented cast provide a great ensemble performance, the three independent stories meaning that no-one can dominate the performance. Everyone has really good timing, which is necessary due to the integration of the stories and the use of sound effects. Mr Monkey did rather find the the layout of the set meant that he concentrated on the nearest family, and had to view the others through a fair amount of scenery. The three plays merge seamlessly; Mr Monkey didn't read the program until the interval and hadn't known it was three plays run together. There are many moments when half the actors on stage are silent, but that appears perfectly natural and just adds to the impression of a physically tight knit community in which there is little privacy. Mr Monkey was a little concerned that the lack of doors on the set meant that every time anyone went through a door they mimed opening and closing the door, often also miming putting on or taking off outdoor clothes. Lawrence's stage directions include details of the characters' movements, so it's probably what he wanted (even if it did look odd to Mr Monkey). Mr Monkey thoroughly enjoyed this production of Husbands and Sons and recommends it to anyone, even people who don't like D.H.Lawrence. Husbands and Sons runs until 19th March 2016.